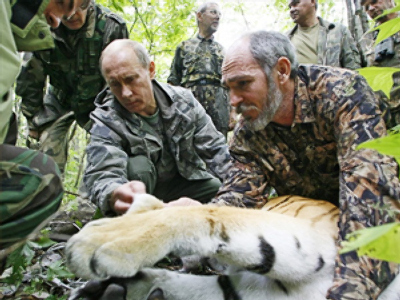 Prime Minister Vladimir Putin, known to be a dog-lover, now has his eyes set on big cats. On Saturday, the Russian premier released from their cages into an enclosure a pair of West Asian leopards. The gesture was meant to symbolize the opening of the first Russian refuge for the endangered species. Part of the ecological program launched in preparation for the Sochi Winter Olympics in 2014, the centre near the Krasnaya Polyana ski resort will breed the big cats and later release them back into the wild. It’s hoped that within 10-15 years the area will be repopulated with leopards, which were once found in the Caucasus but were exterminated at the beginning of the 20th century. Classified as endangered on the IUCN's Red List, West Asian leopards still exist in Iran, Armenia, Georgia, Azerbaijan, and Turkmenistan. The pair for the newly-opened Russian reserve was caught and delivered by plane from Turkmenistan. During today’s phone conversation with the Turkmen President, Gurbanguly Berdymuhammedov, Putin thanked him for the “very beautiful present”. Putin arrived at the site in his recently purchased Russian “Niva” off-road vehicle, along with members of the International Olympic Committee – Jean-Claude Killy and Gilbert Felli. They were inspecting the construction of the Olympic facilities in Sochi, the Russian Black Sea resort. Killy credited Russia with having met all its commitments in preparing for the Olympics and said the two leopards' delivery to Krasnaya Polyana meant the country had even been doing more than keeping its promises. The RIA Novosti agency writes that Putin was asked what he thought about Killy’s comments concerning the leopard being one more symbol of the Olympic movement. The Russian premier said he wished the big cat would become “our Olympic symbol and the symbol of the wild nature revival”. However, he added, the final decision will be made by the Russian citizens. “We will ask them,” he added. It’s expected that five more leopards will be delivered to the Krasnaya Polyana centre in the future.